Federal's new Varmint Ammo shoots really well. Not so long ago I made the statement that factory ammo had improved so much that the premium-grade stuff in particular was better than a lot of reloads and that the handloader was not always able to duplicate factory performance. When I tested some new Federal varmint loads that Nioa sent me, in standard weight sporting rifles, the results were mixed. For cartridges of any calibre and specific load to impress me they need to meet stringent accuracy requirements. For varmint loads this means that 3-shot groups at 100 yards will average no more than 3/4 MoA in a standard weight barrel and no more than 1/2 MoA in a heavy-barrel varmint rifle. While I have found a few individual lots of centerfire .22 calibre varmint loads that do this, I have not come across any that would consistently give such fine accuracy. Varmint loads in the larger diameter calibres have seldom come close to equalling my accuracy requirements with exception of certain premium loadings in .243 and .308 Winchester. However, it’s a whole different ball game when it comes to medium calibre big game cartridges from .270 to .338 calibre. For this category of powerful loads, generally I demand that the worst groups not exceed 1-1/2 MoA for five shots at 100 yards. For big bore dangerous game loads (where shots are more often measured in feet rather than yards) I am satisfied to relax my accuracy standard to 2 MoA at 100 yards. However, I insist that a truly premium-grade hunting bullet be used - that is, one that will expand to almost double its diameter, hold together and retain most of its original weight to penetrate deeply. In recent years, factory loads (and rifles) that meet my criteria have become fairly common, so that I now often find myself using store-bought ammunition for all kinds of hunting whereas two decades ago I would never have considered doing so. 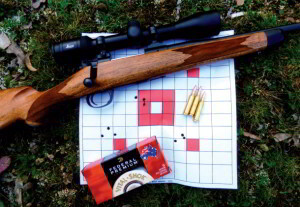 - the .30-30, a cartridge seldom known for its accuracy. Last year a mate appeared with an early seconhand Marlin 336 with a Redfield Revenge 3-9x40 scope. He wanted help to sight it in, so we hied ourselves out to the range and used ammo that had accompanied the rifle - Federal Premium loaded with the Nosler 170gn Partition. a 5-shot group which further amazed us. Few people would believe how well that old levergun grouped with Federal Premium ammo. The first three shots were in 1.05 and the last two increasing it to 1.25. My mate has since told me that using Federal Premium loads with 150gn Barnes and 170gn Nosler Partition bullets that outfit seldom puts five shots over 1.5 MoA. Go figure! I can duplicate the ballistics of this Federal .30-30 Win. load using the same cases, primers and bullets, but I’ve never been able to equal the accuracy of it, nor have I ever been able to gain the same relatively low pressure level at the same velocity. You’ll ask, why not? Probably because there’s no canister propellant available that’s identical to that used in the factory load. - a Ruger M77 MK II and a custom Carl Gustav FFV. Sadly, I’ll always regret selling both those rifles which duplicated the velocity with my reloads using the same components and H4831sc, but I never was able to better its accuracy. One of my favourite guns is a Ruger M77 MKII Hawkeye in .257 Roberts, a sub-MoA rifle with reloads using the 85gn Nosler Ballistic Tips and 110gn AccuBonds, but while it shoots tight groups with almost any bullet weight and make, it doesn’t shoot well with 120gn bullets no matter what reload I use. Yet it will do one-minute or better with Federal’s .257 Roberts +P load featuring the 120gn Nosler Partition at 2800fps. Once again, I can easily duplicate the case, primer, and ballistic uniformity of this load and also get an extra 190fps from my Ruger which has been long-throated, with Reloder 22. What I cannot duplicate is the accuracy of the Partition with any other 120gn bullet. The best 5-shot groups are seldom under 1-1/2 MoA. This is the only load that Federal lists for the .257 Rob., and I have successfully used it on fallow and red deer. The late Bob Milek once told me he took several Wyoming elk using the same load. The .338 Win. Mag. is another cartridge where factory loads are superior to most reloads. There are three loads that I can match but have never been able to improve upon. These are Federal Premium loads using the 210gn and 250gn Nosler Partition and the 225gn Trophy Bonded Bear Claw. Tested in a Ruger Hawkeye blued/walnut rifle they always shot groups at least 1/2 inch smaller than my very best reloads. While nothing to worry about in the field, it shows just how good factory ammo has become. 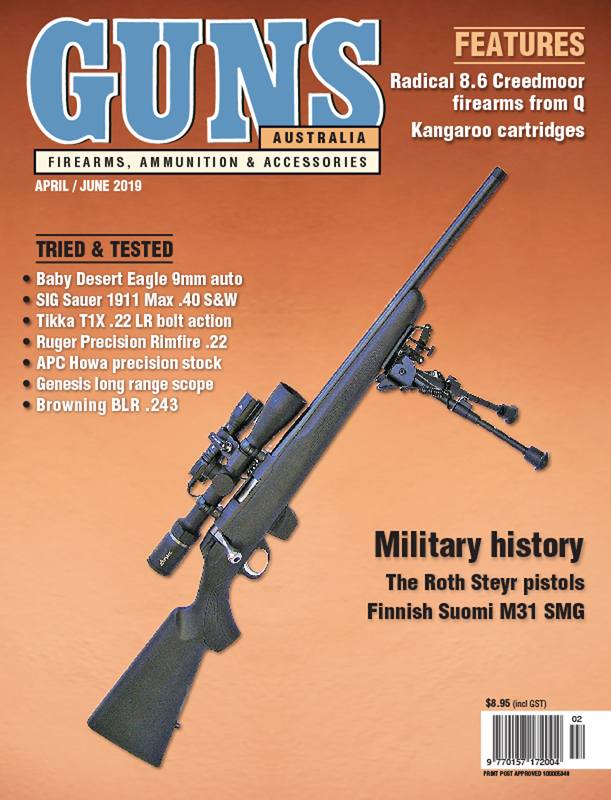 My latest experience was with Federal’s Premium Vital-Shok .300 Weatherby Magnum ammo in New Caledonia only served to reinforce my previous high opinion of its capabilities. 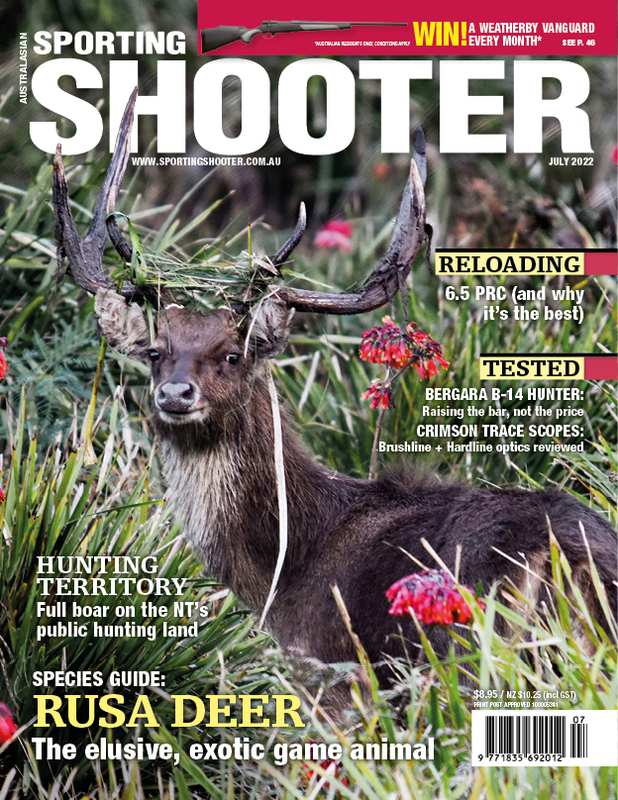 Shooting the 180gn Nosler Partition, turning up 3190 fps in the 650mm barrel of a borrowed Winchester Model 70 Classic Synthetic at 3200fps, I knocked off a rusa stag lying in forest edge at a measured 311 yards. Accuracy of rifle, load and bullet’s effect could not be bettered. The Federal varmint ammo sent for testing carries the Australian flag as a logo on the packet together with “Proudly made in the USA for the Australian hunter.” All three calibres were loaded with Speer’s Vital Shok hollow-point bullet - 52gn in .223 Rem. and .22-250, 75gn in .243 and 130gn in .308 Win. All of these bullets have one thing in common, a thin jacket and large cavity deep enough to give explosive performance on small pest animals no matter how light the resistance on impact. Vital Shok projectiles are designed to open up fast and fragment at close range, but give maximum expansion even at excessively long ranges at lower velocities.. The 52gn HP in .223 and .22-250 has a sectional density of .147 and B.C. of .225 and muzzle velocities are 3275fps and 3750fps respectively. Handloaders have proven it can be driven to near 4,000 fps. The 75gn HP in .243 has an S.D of .181 and B.C is .234 has the respectable velocity of 3375fps in .243, but is capable of velocities of up to 3750fps in the .240 Weatherby. The 130gn .308 with a S.D of .196 and B.C of .263 clocks 3050fps. But I believe it’s velocity can be boosted to 3500fps in a .300 Win. Mag. Now that would produce atomic performance! never failing me once on the biggest muddy boar. And the 130gn spitzer never failed to drop a red stag in its tracks. Earlier this year, I made a one-shot kill on a big sambar shooting the 160gn Mag-Tip in my 7mm Harvey Magnum. I must say that the Mag-Tip which combines the Hot-Cor design with a 45 percent thicker jacket in the critical shank area, and a protected tip with internal fluting for more reliable expansion is one of my favourite deer bullets. The Grand Slam is similar but two different core alloys are used; the front core is relatively soft while the rear core is harder and locked into place by a ring of jacket material. It also has a cannelure and is claimed to retain up to 85-plus percent of its initial weight, but I’ve not noticed much difference in its performance over the Mag-Tip - each has performed equally well for me. However, in my .270 Weatherby Magnum, I prefer the 150gn Grand Slam which hits hard way out yonder when boosted out at 3250fps. Federal was first to come out with the “premium” concept when they started assembling smaller lots of ammo from selected, matched components which showed a small accuracy edge over the competition.For ultimate accuracy from the new Federal varmint loads you’ll need a genuine heavy-varmint rifle with a high magnification scope. Most makers offer varmint rifles in .223, .22-250 and .243, but they can also be obtained in a variety of standard weight sporters. Since I don’t own a rifle in .22-250. 243 or .308 I had to influence my friend Ken Harding to loan me his three Kimbers. For at least 95 percent of us the .224 calibre reigns supreme with varmint rifles able to group under a 1/2 MoA with patenty lack of recoil. The scope of Federal’s two new .224 loads will satisfy the needs of the majority of varminters, the smaller .223 producing commendably mild reports. 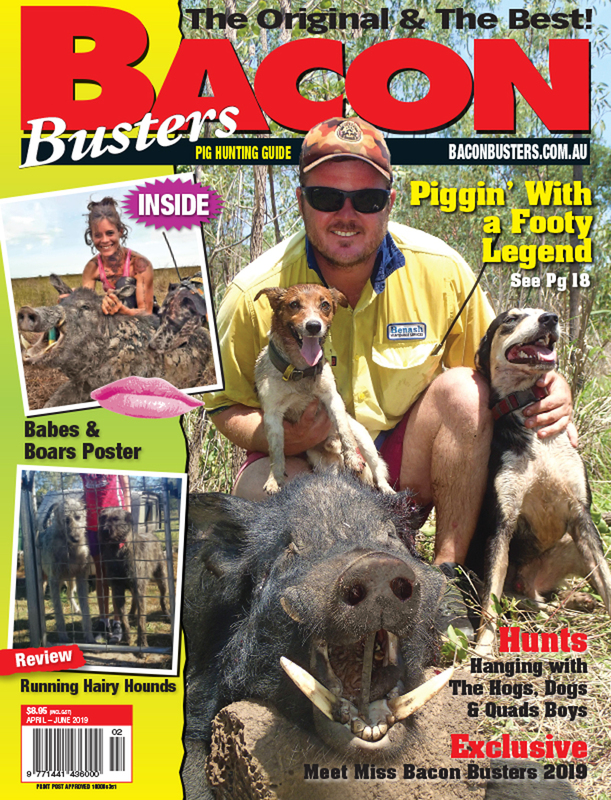 Very few varmints are taken over 250 metres, but if you want to try your luck on varmints at 300-plus, then the ideal Federal load for you is the .22-250. 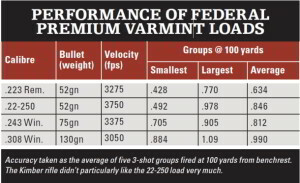 You can judge just how good these new Federal varmint loads yourself by checking the range results in the table. In the field frangible 75gn .243 bullets proved to be fantastic killers that disintegrate rabbits over normal ranges. Overkill maybe, but this is really the load for the man who does virtually all his sniping at ranges in excess of 300 metres. The .308 is an exceptionally accurate round largely because of the years of money, brains and energy which have been expended in the development of loads for target/tactical rifles. Handloaders seldom if ever managed to get .224 accuracy with very light .30-calibre varmint bullets of 110-120 grains, but they did with the 130gn HP which is a proven sub-1/2-minute performer. It’s ironic that Federal is producing ammunition equalling or bettering handloads. Highly sophisticated, it’s round-to-round variations in pressures and velocities are amazingly small. It would take a very savvy, careful and patient handloader to load ammo that is more accurate and as consistent and safe as factory stuff. It can be done, but the average shooter ain’t going to do it by buying a tool and some bullets and whipping up some loads in his back shed. And it’s a fact that shooters who have no choice but to shoot factory fodder are not handicapped because Federal factory ammo performs as well as the majority of handloads and better than most.